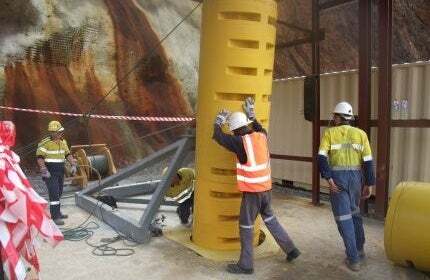 Safescape provides the Safescape Laddertube escapeway system to mining sites and other industrial operations. The company has installed 247 ladderways at more than 55 mines worldwide. Laddertube is a fully enclosed, durable polyethylene product that is not impacted by water, salt or other mineral deposits. The system fits comfortably within a 1m raisebore to provide optimal user safety, and also requires minimal upkeep. The escape route is simply and efficiently installed to any practical length, and represents great value for money for underground mines. In the advancement of underground mining escapeways, Safescape Laddertube represents a revolutionary concept in design. The system’s enclosed travelway prevents dirt, rocks, and saltwater ingress, and doesn’t corrode or degrade over time, providing the user with a dependable security. Safescape’s Laddertube was designed specifically for mine rescue operations. It is a straight-line ladder system with landing gate style platforms. The design allows for a rapid stretcher extraction and has a built-in fall arrest static line. Climbing with breathing apparatus is aided by the smooth interior surface, and the design of the steps also allows the climber to use their lower leg muscles, reducing foot fatigue. This presents a significant benefit over rung-style ladders. Safescape Multi-Bund has been designed as a modular, lightweight bunding product. It can be used empty for delineation of pedestrian access areas around heavy equipment, filled with water, concrete or other materials for heavy-duty applications requiring protection from vehicle interaction. The Multi-Bund has six bolt-down points for anchors up to 45mm in diameter, giving edge protection from trucks and loaders. In this type of application, the Multi-Bund acts as concrete formwork, creating an appropriate shape where the quality of the cemented fill determines the strength of the finished bund. Multi-Bund is available in a variety of different colours, as well as materials rated fire-resistant anti-static (FRAS), or glow in the dark. Safescape’s vision is to create a safer and better underground mining workplace. Safescape prides itself on delivering an exceptional service and product to its valued clients. With offices in Bendigo, Perth and Denver, Safescape is able to meet the needs of mining companies worldwide. To date, around 12,300m of Safescape Laddertube has been installed in more than 55 mines across the world. The success of Safescape has been recognised through the company receiving various awards. Introducing innovative new or improved products into any industry can be challenging and costly for both the supplier and in some cases the stakeholders where time and effort go into change management and ensuring employee acceptance. The requirement for secondary egress from underground workings has long been regulated in Australia. Safescape Multi-Bund has been designed as a modular, lightweight bunding product. It acts as versatile bunding for mining applications. The Safescape Edge Protector (EP) is a system for improved edge protection in open pit mines. The structure is designed to allow open pit haul roads to be narrower while retaining the same or better safety characteristics.